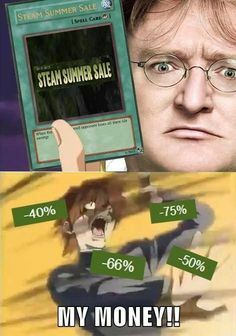 The steam sale is live! It goes from now until July 4th! Which is great! What games do you recommend & why? Fez - playing this right now, another great puzzle platformer type game. Oh, this will be amazing way to fill up a hard drive! First time taking advantage of a Steam sale! I haven't sifted through everything yet, but last night I happened upon Red Faction: Armageddon for $1.99. I've played through it on console and it's not the best in the series by any means, but for $1.99 I had to. Also saw Age of Empires II HD for $3 or $4 dollars, so I'll have to pick that up as well. Filling up on games for next 6 months. Picked up Skyrim with expansions for $25. In anticipation for the upgrade that comes free later this year. I'll probably go back and look a few more times to see what I missed and what's worth it. Also to see what I can pick-up and use for donation giveaway incentives! I'm planning on picking up all the Ys games that are on sale. Next year for Easter I want to do a marathon for Extra Life called "Happy Yster"